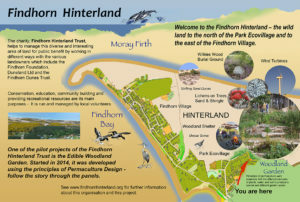 This was a project initiated by the Findhorn Hinterland Group in 2014 in response to a Scottish wide Community Woodland Association (CWA) initiative looking at ways of diversifying community woods/forests to make them more productive and relevant to local communities. The CWA did not ultimately develop this initiative but by that time the EWG was already well underway with this project. What is it? 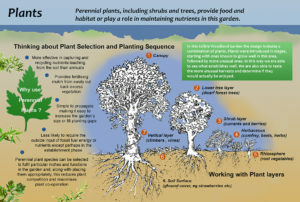 The FHT Edible Woodland Garden is a small demonstration project set up to show how a small piece of land that was initially a degenerate piece of woodland can be transformed to produce perennial food for both humans and wildlife. 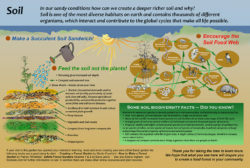 This way of growing is based on mimicking the creation of a productive forest by initial soil modification and subsequent use of appropriate plants to lock in nutrients, organic matter and moisture into the system. The project provides information and inspiration to look at the feasibility of doing this on other pieces of land and ultimately on a larger scale. 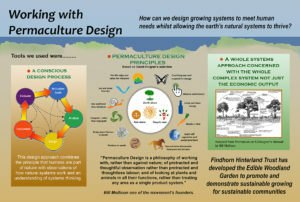 Such experiments may be useful as communities are required to address issues of food security as the consequences of peak oil take hold and will provide a living legacy with long-term community benefits. It has proved to be of considerable interest as an educational/ demonstration initiative and has brought together many local people to make it physically happen as well as generate funds to pay for it – it has been a true community enhancing initiative. Let the information boards do the talking. 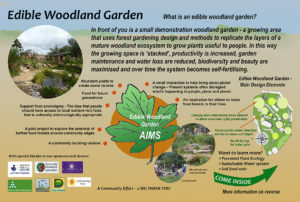 A set of six information boards were produced and erected on the site to explain different aspects of the Edible Woodland Garden project. 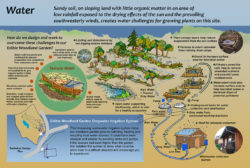 They are reproduced here as they provide some useful basic information about the project including the permaculture principles behind its design and how perennial plants and various features are used to work with the challenges of the soil and lack of water on the site. You can click on them to enter a gallery of easily readable versions (using the left and right arrows to navigate).